Posted November 10th, 2017 by Pine Tree Mall & filed under News. Posted August 23rd, 2017 by Pine Tree Mall & filed under News. Famous Footwear is Coming August 9. Posted July 13th, 2017 by Pine Tree Mall & filed under News. 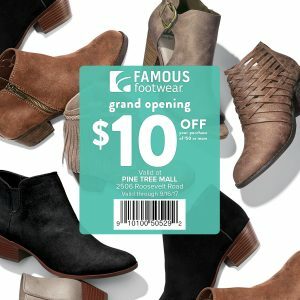 Famous Footwear is opening next to Dollar Tree in Pine Tree Mall on August 9! Enjoy Buy One, Get One 1/2 Off great brands for Back-to-School through September 13. Plus, stop by any Saturday from August 26 to September 16 for a chance to win free shoes as a part of their Grand Opening Celebration! Posted March 27th, 2017 by Pine Tree Mall & filed under News. The Red Cross will be holding a blood drive here on March 31st in space E11. That’s located across the commons area from GNC. Posted February 20th, 2017 by Pine Tree Mall & filed under News. Welcome to Pine Tree Mall and Marinette. Planet Fitness is now open. Please come and check out their new location on the south end of the Pine Tree Mall and sign-up or call 715.732.4794. Posted February 8th, 2017 by Pine Tree Mall & filed under News. 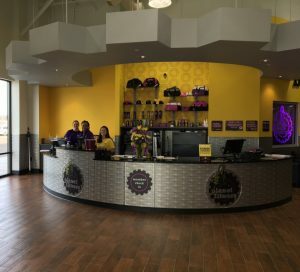 Planet Fitness Coming Soon – Pre-register Now! Posted January 27th, 2017 by Pine Tree Mall & filed under News. Planet Fitness is coming to Pine Tree Mall mid-February. Preregister during their pre-grand opening sale happening now at their temporary location across from GNC inside the mall. For more information call 715.732.4794. Posted January 26th, 2017 by Pine Tree Mall & filed under News. During the Christmas holiday, Pine Tree Mall and St. Vincent de Paul teamed up to have a giving tree in the mall where people could take tags from the tree and buy for the child on the tag. Pine Tree Mall donated a vacant space for St. Vincent de Paul to distribute the packages. We thank all volunteers that were involved in this event. Words alone cannot express our appreciation to you and the Pine Tree Mall owners for allowing St. Vincent de Paul store space for Back to School and our Christmas Program. The facility was a perfect fit for us. We thank you for “helping us help others” in providing for those who are less fortunate. The annual 2016 Christmas Season bell ringing for the Salvation Army was a success. 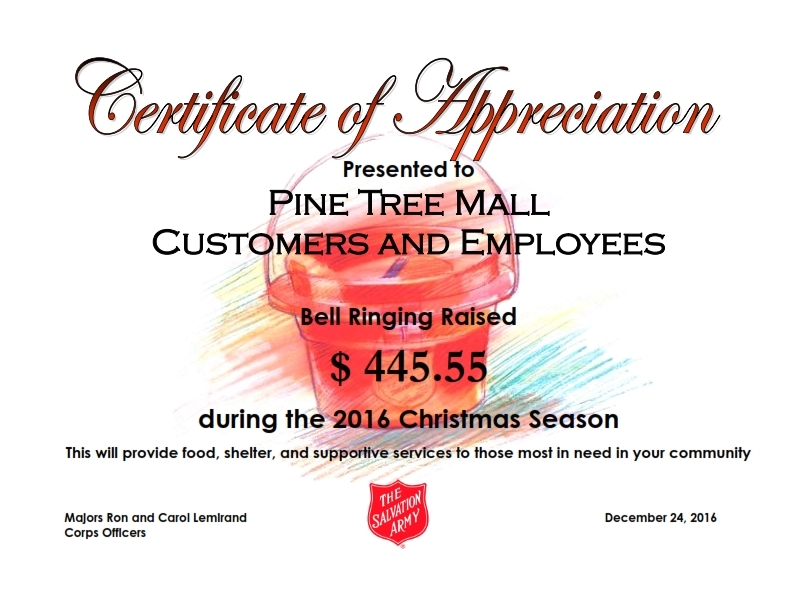 Pine Tree Mall Customers and Employees help to raise $445.55 that will help to provide food, shelter and supportive services to those most in need in the Marinette community. The Salvation Army presented Pine Tree Mall with a Certificate of Appreciation below. Posted November 15th, 2016 by Pine Tree Mall & filed under News. 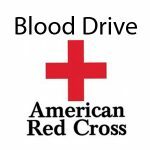 Help Save A Life By Donating Blood on December 2, 2016 here at Pine Tree Mall.